Along with our wide selection of clear, low iron and coated glass, PRL offers 10 different shades of Tinted Uncoated Glass. Tinted uncoated glass provides significant improvement in solar performance over clear glass by reducing the amount of sunlight entering a room and providing an economical option for reducing air-conditioning costs. In addition, tinted glass enhances the beauty of a building’s exterior architectural appearance and does not produce the exterior reflective issues that coated glass can. Tinted uncoated glass can be used in insulated and laminated units as well for achieving additional insulation or sound control. 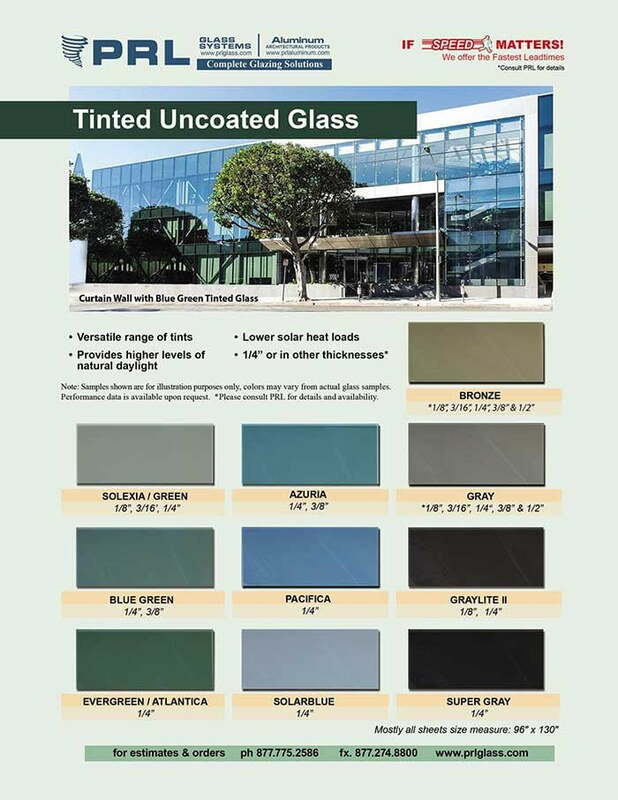 PRL stocks tinted glass from 1/8″ thick to 1/2″ thick in a variety of colors including bronze, greys, greens and blues. We offer free samples for your project submittals or showroom displays. Feel free to contact our helpful staff and ask for samples and performance data sheets as well. PRL continues to work around the clock to provide the fastest lead times and maintain the highest customer satisfaction possible!